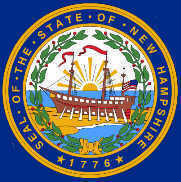 The blue State Flag of New Hampshire depicts the central image of the state seal surrounded by a laurel wreath, a symbol of victory. The ship is the frigate Raleigh that was built in Portsmouth, in Rockingham County, New Hampshire in 1776. It serves as a symbol of honor, heritage and regional pride and is displayed at state buildings. There is a strict Order of Precedence for flags. State Flags are displayed in order as they entered the Union. Car Flags are often displayed to represent of an individual's allegiance to their state. New Hampshire State car flags are used by their owners as mobile emblems of their home. Car flags are usually made from strong materials and are attached to a car via a pole and clip window attachment. What is the design of the New Hampshire state flag? What does the ship symbolize? According to the ancient laws of heraldry a ship was an early symbol of the Christian church as a place where the voyagers of faith could gather and sail over the rough areas of life to the good destination God had for them. What does the laurel leaf symbolize? Who designed the New Hampshire Flag? What is the history of the New Hampshire Flag? The first flags in the state were flown by the military. 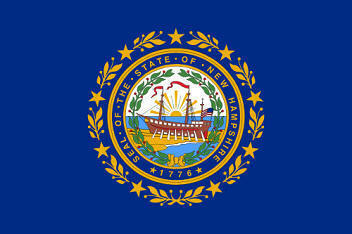 The New Hampshire flag is kept and used as required by the code specified in the constitution of the state. to the modernised impression of the state flag and seal. The large gray granite rock or boulder has disappeared - the official state nickname is "the Granite State". The official description of the seal in the New Hampshire Statutes, Section 3:9 reads "...a granite boulder on the dexter side..."